Ms. Thomas-Raynaud, situated in Paris, France remotely participated in the conference taking place in Nairobi, Kenya—this speaks volumes about the potential of Information and Communications Technologies (ICTs) to bridge divides. ICT forms the backbone of today’s digital economy and has a strong potential to accelerate economic growth and improve people’s lives in fundamental ways in developed and developing countries. 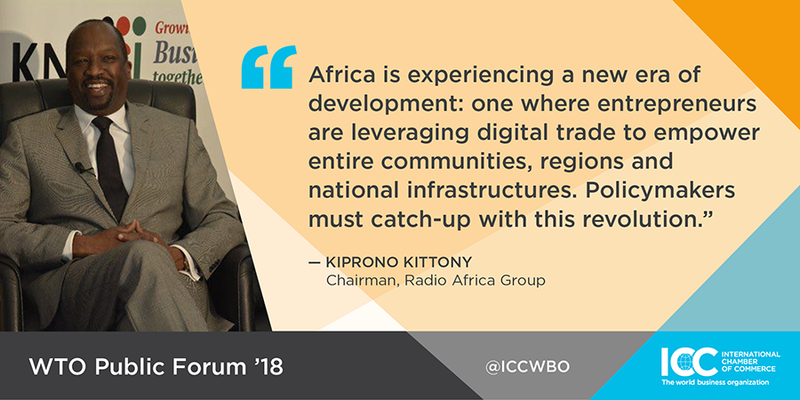 When the Africa Information & Communication Technologies Alliance (AfICTA) Summit convened in Nairobi, Kenya this week, they heard from ICC, key policy considerations and recommendation for leveraging ICTs to pursue the priority goals for the African continent. The theme of the AfICTA conference focused on the “Big Four Agenda” of President of Kenya Uhuru Kenyatta and ICC’s participation provided explanation of the holistic policy framework recommended for identifying effective policy approaches to leverage ICTs for achieving the United Nations (UN) Sustainable Development Goals (SDGs). “SMEs are among those who can play an important role in achieving the goals. Governments can facilitate sustainable investment and promote business innovation by working with stakeholders and working across disciplines to better inform policy choices. Data localisation policies are among those that can create unintended barriers to SMEs,” said Elizabeth Thomas-Raynaud, ICC BASIS Director and Senior Policy Executive for Digital Economy during her keynote speech to the summit. No one-size-fits all approach to nurturing the development gains of digital technologies but governments should start by being future-orientated. Equipping populations with the skills needed to innovate and leverage digital tools, promoting investment and market entry to attain greater coverage of networks and driving inter-operability across policy and regulatory landscapes. An online database could help the population knows what medicines are available to them. Implementing an efficient supply-chain management system of pharmaceuticals could make medicine available to the public and ensure that it gets to their location. Basic ICT is already helping farmers in developing countries keep pace with accelerating demand for milk products that have been a force in improving quality of life and boosting rural economic growth. The preservation of large amounts of perishable items such as milk in tropical countries requires extensive processing and distribution planning. Control systems provide intuitive automation and maintenance solutions that ensure a hygienic, efficient environment for processing and preserving the health benefits of milk. Land in urban Kenya is incredibly expensive, in part due to the lack of transparency in the process of buying, selling and renting. The implementation of an Internet platform that streamlines this process could inform the population as to what land and properties are valued at, effectively standardising this process and making rentals and ownership more accessible to the public.